As both Joe Cortright of the City Observatory and I have written, Millennials—people who have reached adulthood since the beginning of the millennium—and their in-migration, are largely driving the changes that American cities are going through. More specifically, it is the ones with college degrees who are driving the change. That leaves a lot of questions, though, both about what’s currently going on and what’s likely to happen in the future. Two particular questions come to mind: first, where are they moving to, and how does that affect those places? And second, is this trend likely to turn into a tidal wave in the future, or ebb? In attempting to answer the first question, I’m deliberately going to look not at the handful of “hot” cities, like San Francisco and Washington DC, but at the in-between cities, the ones that are also changing, but in more gradual and uncertain fashion. I don’t have much in the way of computer skills, so I was recently delighted to learn that PolicyMap has created a feature they call 3-Layer Mapping, with which people like me can create multi-factor maps. I decided to see what different cities would look like if I put two factors together to pin down those areas where 50 percent or more of the adults 25 or older have a BA or higher degree, and where 25 percent or more of the population is age 25 to 34. To put that in context, nationally 29 percent of adults have a BA or higher degree, and 13 percent of the population is age 25 to 34. So these are areas that are close to double the national average on both indicators; in other words, concentrations or critical masses of educated Millennials. I then created maps for two periods—one for the year 2000, and the other for 2014—to see what was happening. You can see the maps below for three cities, Cleveland, Chicago, and Baltimore. They can tell quite a bit about how the spatial dynamics of the cities are shifting; but also, how they’re not shifting. Overall, it’s clear that Millennials are making an impact: in all three cities, the area that meets the criteria has grown since the year 2000, as members of that generation have moved in. But the patterns and differences between the cities are significant. Not much is happening in Cleveland. Outside of downtown, Millennials have moved into two small pockets, one in Tremont just south of downtown, and the other in University Circle, sandwiched between the Cleveland Clinic and Case Western Reserve University. Baltimore has seen a larger influx of Millennials than Cleveland, but the basic pattern is similar. From a small cluster around the Inner Harbor in 2000, Millennials have moved north into downtown, and east to what’s now known as Harbor East, around Fells Point and Canton. At the same time, they’ve reached critical mass in a couple of spots adjacent to the Johns Hopkins Campus, particularly the Hampden neighborhood. 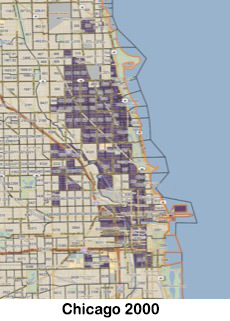 Chicago, which saw an increase of nearly 80,000 college educated Millennials between 2000 and 2014, has seen the areas dominated by Millennials expand in most directions to the north, northwest, west, and southwest from the core, including movement upward along the Blue Line past Wicker Park and Bucktown, and into the Near West Side toward the UIC campus. What does this mean? A lot of it is predictable, and in some respects that’s what makes it significant. It bears out that Millennial growth moves incrementally out from downtowns, and concentrates in closed-in neighborhoods and areas around major universities and medical centers, like Johns Hopkins or the Cleveland Clinic. In Philadelphia, one can see a growing cluster around the University of Pennsylvania. There’s no evidence of leapfrogging, of movement into areas that are not contiguous to pre-existing concentrations or, again, to major universities and medical centers. These are not the only areas in these cities that are seeing some Millennial in-migration—these are the areas where it has reached critical mass. 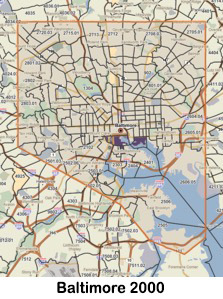 If one takes a closer look east of downtown Baltimore, one finds that in-migration is moving north, gradually filling the gap between Harbor East and the Johns Hopkins Medical Center. It is not moving west, though, where it seems to have hit a wall. We’re talking, though, about very small parts of these cities. Even in Chicago, probably less than 10 percent of the city, if that, meets the criteria that I set. In Baltimore and especially in Cleveland, far less. In Detroit, only two out of over 300 census tracts met my criteria in 2014, nestled between Wayne State University and the Detroit Medical Center. The reality is that most neighborhoods in these cities have little to fear or to hope for, depending on one’s perspective, from the movement of Millennials back to American cities. At the same time, though, some areas have changed significantly, and at least a few more are likely to change. Looking at the kind of data I’ve used to make these maps, along with other data on sales prices and the like, can provide people working in community development with useful information about the path of change, and how it’s likely to affect different neighborhoods. Change, one might say, is semi-predictable, and it’s worth spending the time and effort to understand the larger picture. This is what’s happening now, and in my next post I'll speculate on what might happen in the future. Alan Mallach, senior fellow at the Center for Community Progress and the National Housing Institute, is the author of many works on housing and planning, including Bringing Buildings Back, A Decent Home, and Inclusionary Housing in International Perspective. He served as director of housing and economic development for Trenton, New Jersey, from 1990 to 1999, and teaches in the City and Regional Planning program at Pratt Institute. Beware basing planning decisions on Millenials. Seriously these are kids who will change as often as they switch cell phone providers. Today they move into downtown areas and tomorrow when they have kids they move out. Then what? Are the adults in the room abdicating responsibility by following rather than leading? Adults who have already lived through various life stages have the experience to know where the millenials may want to be years in the future. Also, that age group may end up buried under so much debt their futures are unimaginable. All those “adults who have lived through various life stages” did a bang up job on the college system, it now requires the average student to take on a small fortune just to get a 4-year degree. Obviously, the previous generations pulled up the opportunity ladder, as they voted themselves lower taxes instead of keeping student tuition low. Who do you think is listening when you say “just trust us, we know what you’ll like… someday “?